President of the European Parliament Antonio Tajani on Thursday called on Turkey to abide by international law following news of Turkish airstrikes killing four civilians in the Kurdistan Region’s border areas. According to residents and local activists, overnight Turkish airstrikes killed four civilians camping in rural areas as part of Newroz celebrations in the Choman district of the Kurdistan Region, 160 kilometers northeast of Erbil. A statement released by the Kurdistan Regional Government (KRG) later expressed its concerns over Turkey’s continuous targeting of Kurdistan Workers’ Party (PKK) fighters on its border areas, urging the PKK to leave to prevent further civilian casualties. 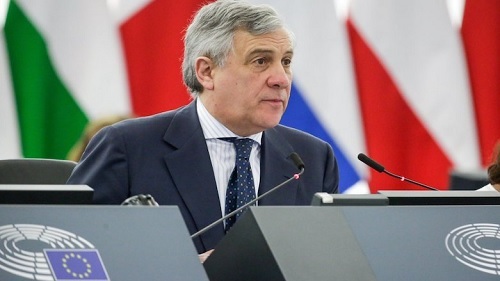 Responding to a question from Kurdistan 24 correspondent Barzan Hassan during a press conference in Brussels, Tajani said the EU has always called on Turkey to follow international laws. “Turkey is one of our interlocutors, but like all international subjects they are bound to respect international law,” Tajani stated. The EU President also addressed Turkey’s military offensive in Syrian Kurdistan’s Afrin region, which has killed over 250 civilians and displaced thousands. “I would remind [all the parties involved in the conflict] that there are human lives at stake; human lives which are coming to an end all too often for wars which don’t have any sense,” Tajani affirmed.